You can easily bind a ComboBox (or ListBox) to an enumerated type’s values using an ObjectDataProvider. The ObjectDataProvider allows calling a method and then using the result of the method call as a binding source. 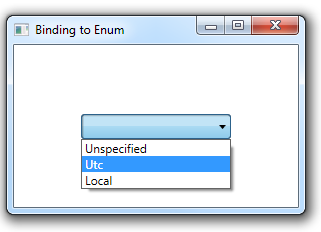 To get the list of values for an enumerated type, we call the Enum.GetValues method, passing in the specific enumerated type. In the example below, we do this in an ObjectDataProvider. We can now use the output of the ObjectDataProvider as a data source for our binding. This gives us a ComboBox that lists the possible values of the DateTimeKind enumerated type.